FLORENCE, Ky. — Mazak Corporation encourages those involved in the metalworking industry to attend its DISCOVER 2015 technology and education event, taking place October 27 – 29 and November 3 – 5 in Florence, Kentucky. Here, the leading machine tool builder plans to spotlight new technologies and trends that will drastically change how part manufacturers operate, including unconventional ways to drive operational efficiency via additive manufacturing, CNC technology and the Industrial Internet of Things (IIoT) concept. Additive manufacturing is creating a shift in the way engineers and designers think about product development, and Mazak is leading the way with its additive-capable INTEGREX i-400AM. The HYBRID Multi Tasking machine will make its North American debut at DISCOVER 2015, and attendees will experience how it uniquely integrates laser cladding with advanced full 5-axis milling and turning capabilities. With reshoring on the rise, domestic manufacturers must find new ways to deliver products faster and of higher quality than ever before to remain globally competitive. Such pressures have given rise to IIoT where "smart" components (data storage, controls and software), automation and advanced connectivity between machines and external data sources work hand-in-hand to significantly improve manufacturing productivity, reduce operating costs and much more. In addition to getting a first-hand look at IIoT – which is expected to be a significant driver of manufacturing productivity and growth over the next decade – attendees will leave the event with a greater understanding of how shared intelligence and access to real-time information can optimize their processes in ways never thought possible. Overall, more than 30 of the latest Mazak machine tools will perform real-world cutting demonstrations throughout the event. Applications experts will be on standby during the demonstrations to discuss total manufacturing solutions as well as part-processing improvements with attendees. The company will also offer a series of seminars that will teach attendees the latest metalworking tools, trends and techniques for improved productivity and profitability. Additional DISCOVER 2015 details, including registration information, are available at www.MazakUSA.com/DISCOVER2015. The company will continually add information to the site over the coming months so those interested in attending the event should check back often. Event updates will also be available on Mazak’s Facebook and Twitter pages. Mazak Corporation is a leader in the design and manufacture of productive machine tool solutions. Committed to being a partner to customers with innovative technology, its world-class facility in Florence, Kentucky, produces over 100 models of turning centers, Multi-Tasking machines and vertical machining centers, including 5- axis models. Continuously investing in manufacturing technology allows the Kentucky iSMART Factory to be the most advanced and efficient in the industry, providing high-quality and reliable products through its "Production-On-Demand" practice. Mazak maintains eight Technology Centers across North America to provide local hands-on applications, service and sales support to customers. 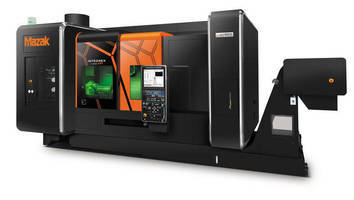 For more information on Mazak's products and solutions, visit www.MazakUSA.com or follow us on Twitter and Facebook.